i’ve been working on this for a while and it’s pretty confusing. I have Lync2013 client and server (2013 pool) and wanted to install the eval update – I have installed the x32 update from the eval site – but I canNOT seem to get the skype interface for the client to show up. I have used the regedit above and ADDED the key (1) as well as set my clientpolicy to enableskypeUI=true and verified replication. Any ideas what i’m missing here? Thx! If you have Lync 2013 installed from the Office 2013 MSI, then you should download the http://www.microsoft.com/en-us/evalcenter/evaluate-skype-for-business update that will make the changes to your existing client. Great!! 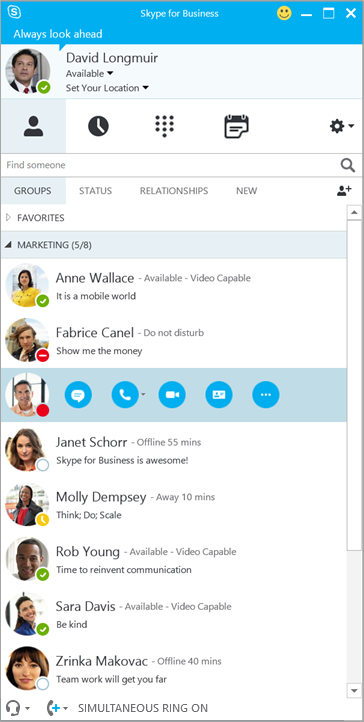 Only took me 2 min to switch Lync look to new Skype look… Thanks for posting!! !